Editor’s note: Mong Palatino is a Philippines-based writer and former lawmaker. The views expressed are his own. The images of the devastation wrought by super typhoon Haiyan as it hit the Philippines the past two days have shocked people across the globe. But be prepared for even more heartbreaking images and stories of the storm’s aftermath once reporters and rescuers are finally able to reach remote coastal towns here like Samar and Leyte Provinces. Haiyan, the strongest typhoon this year, caused a tsunami-like storm surge that almost completely wiped out facilities in Leyte Province, killing thousands in the process. Indeed, early police reports are already suggesting the number of dead could top 10,000. The scenes in Tacloban City alone are heart-wrenching. Dead bodies are everywhere, dazed survivors are walking the streets, and parents are desperately looking for food and water. Some sought refuge in the airport, but this was also destroyed during the storm. Evacuation centers and public markets have been flooded. 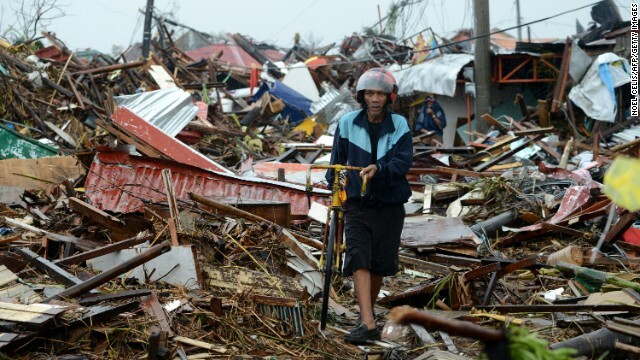 Even the mayor of Tacloban reportedly had to be rescued from his home. Power lines are down and could take a month to be restored. It seems particularly cruel that the already powerless here literally now don’t have power. After surveying the ruins in Tacloban, a Cabinet official likened the flattened houses to scattered matchsticks. A journalist reported that he felt like he was inside a washing machine during the storm surge. One survivor likened the eerie streets of Tacloban to a scene in the Hollywood zombie flick World War Z.
Tacloban is an urban hub with modern communications and transportation facilities, which explains why the world was so quickly able to see the deadly impact of the storm. (It is also, incidentally, the hometown of Rep. Imelda Marcos, the wife of former Philippine dictator Ferdinand Marcos). But Tacloban, the capital of Leyte, which together with Samar Province comprises the Eastern Visayas region, is also one of the country’s poorest regions, an area plagued by hunger, joblessness, and deprivation. Typhoon Haiyan has therefore been particularly devastating for this part of the world, and has dashed all hope that the region’s people could be lifted with the rising Philippine economy. In fact, while the Philippine economy is one of the fastest growing in the Asia-Pacific – growing at 6.6 percent last year – extreme poverty is a continuing reality for many in this country, especially those living in the country’s rural eastern corridor and coastal barangays (villages). These are difficult times for the Philippines. But sadly for many Filipinos, this is not so much the year of living dangerously as living disastrously. Conflict on the southern island of Mindanao has wreaked the livelihoods of people there, while Bohol and Cebu Provinces are still recovering from a powerful earthquake that struck the islands just last month. Several Luzon provinces near the capital of Manila, meanwhile, have already been reeling from agricultural losses caused by flash floods. Of course the immediate objective now is search and rescue, and Filipinos will welcome the fact that during times of crises like this, other nations will no doubt respond by sending aid and humanitarian assistance. But once the relief provisions have been distributed, will there be enough left here after the storm to kick start the economy at the grassroots level? The reality is that the Philippines cannot expect to live on charity alone. International aid cannot sustain even a subsistence economy, like that of much of the region that has been worst hit, and so it is essential that Filipinos rebuild with sustainability in mind. Building for sustainability should also mean the country’s resources and rehabilitation efforts should be utilized with climate proofing in mind, and economic policies should be designed to prevent Filipinos from being constant disaster refugees. It’s no secret that the country experiences extreme natural events year round. Situated in the Pacific “ring of fire,” the Philippine archipelago is dotted with numerous volcanoes and active fault lines, not to mention the multiple typhoons that hit each year, such as last year’s typhoon Bopha, the world’s deadliest disaster of 2012. Sadly, each natural calamity has only further exposed the government’s inadequate disaster preparedness. Weather tracking facilities have been revealed as pre-modern or non-existent in some places, while infrastructure such as communications equipment is far too vulnerable, further undermining already inadequate emergency mechanisms. All this is exacerbated by the rapid deterioration of the country’s natural ecosystem. The Haiyan tragedy has reminded Filipinos of their resiliency as a nation, something that is giving hope to survivors and other victims of natural disasters. But this legendary Filipino spirit should also be invoked in our campaign for good governance. Before Haiyan wreaked havoc in the country, Filipinos were outraged by an expose of corruption involving the siphoning of public funds, including disaster funds, by prominent politicians. This latest tragedy should be a reminder that while disasters will strike no matter what we do, cleaner, more efficient governance can sometimes help stop disaster turning into catastrophe. Next entry »The changing role of U.N. forces? I have lived in the Philippines since Jan 2, 2007 and the problems here are not caused just by Marcos mentality of everyone being out for themselves but from the fact that most people here even those that have college educations think that they can do anything they they want to do! This is from letting diseased dogs running wild in the streets to trying to build houses etc that they have no compliance to even think about doing. I refer to it as the legacy of the Spanish colonization of 400 years. I knew a blue eyed Filipino in LA & asked why he had blue eyes expecting an English or German ancestor & instead he said well the missionaries had any woman they wanted & sometimes ever woman in the village. It will take many generations to change the "Spanish mentality of the Filipino people if it is at all possible!! I lived there also. They need a china style revolution. Wipe out the oligarchy- the hard way. Reeducate the population: the death penalty for graft, corruption, etc. And confiscate ALL the land, and foreign bank accounts. Redistribute the land to the poor. Enforce the death penalty on the murdering thieving oligrachies that have ruled with iron fist there for last 40 years. THAT IS THE ONLY WAY TO FIX PHILIPPINES. IVIC AND UCV NANOTECHNOLOGY INVESTIGATION VENEZUELA. Lol @ RZ, maybe the general had to many fruit loops today i think! Or....the alien has landed. The world is literally on the brink of war (and tomorrow's Nov 11th, which may not mean much to some but needs to hit home perhaps now more than ever before). We got an article here on an almost unspeakable real devastation and this pathetic glitch is exploiting it (?). I don't get it. What's wrong with people? True that @ RZ! Now if you could answer that you would be the most loved person on the planet! What i think is people are just in denial. And everyone knows denial solves nothing! And i also think Veterans Day should mean a helluva lot more to people than it does! There is alot missing in the younger generation these days. Respect being the number one thing. Im not sure what the root cause is but i would like to know. The scale of devastation and the people's desperation is beyond words. Aid is getting in, but very slowly. Scores of corpses are piled by the roadside, unburied, leaving a stench in the air, as they rot. People are too preoccupied with their own grievances. The president should show more leadership and urge the nation to act, instead of waiting to be helped. You are right. I am a Filipino and I am looking at the people passing by those dead bodies. I do not know why nobody grouped them and stand up and say to them "Common people, we are all victims here but help from all over is coming so let us clean this area." I can imagine the feeling as we also have lost relatives in December 2011 when typhoon Washi hit our city. We lost a cousin and it was a very sad Christmas for us, Christmas eve we hoped that my cousin will knock at our door and that she was just drifted afar but will be back. She never showed up and her brothers whom we adopted have nightmares in the night calling for her name and her baby. it is sad and now this incident the pains of that year is refreshed. .I can understand why these people are so disturbed but indeed they need people to guide them. They need people to tell them that even if they are victims they can help each other to rise again and build their lives. Someone has to stand and lead these people, someone has to know what these people do for a living. Give them tools and encourage them to be part of the clean up team. They are victims now but they can also be part of the movers to get a day step to better tomorrow. I know this might sound somewhat inconsiderate, but after what we saw in Haiti, I cannot understand why any nearby military bases cannot immediately, and I mean immediately, air drop body bags for the dead. I know, it's not going to save anyone's life or provide immediate assistance to the living. But it is at least one thing that can be done on a more immediate basis. We can't stop natural disasters and the logistics to mobilize so much aid takes some time. But there is no real need for corpses to remain exposed for extended periods of time. Wrong, disrespectful, and likely completely unnecessary. I'm a Filipino working in Saudi Arabia. As I monitor the news in CNN including reading the articles on the devastating storm and its catastrophic aftermath, I am very grateful that so many countries and international organizations are extending assistance. On behalf of everyone in the Philippines, maraming salamat po sa pagtulong niyo (thank you very much for your help), we are one United Nations after all. Yes, we show your country our solidarity. Amazing though is the fact that China is only donating $100.000 this year, instead of a million or two, as many rich OECD countries do. Beijing had been generous towards Manila in the past, but not after the territorial dispute. By roots, the pure Filipino spirit loves freedom, humanity ,nature and God. The native Filipino spirit loves simplicity, joy and happiness. Then we became one abused country and disrespected since colonial period, so the Filipino spirit became impure. Therefore the suffering of the Filipinos is caused by the greed and power of sick political system influenced by consumerism and power hungry Europeans, Westerners and Easterners. By the way, I from the Cordilleras, we may not be rich enough province according to the standard of the world but we get sustenance from our farmlands and our nature. I am very proud of our forefathers who hindered the Spaniards to rule our mountains. Here, you experience the genuine love from the pure Filipino people but sadly infected with deadly political virus. I sympathize to what my brethren from the lowland's great lost has to suffer caused by worlds materialism and climate change. May the grace of God be with them. Governments will NEVER respond effectively to natural disasters.........especially within their own borders. The U.S. is the perfect example..........we mobilize immediately to help other countries, yet drag our heels firmly into the dirt, to do nothing for ourselves.